January 19th, 2018 – Digital Marketing Event with Dr. Scott Snyder!! I was asked in 2017 to become the new Digital Marketing chair of Digital Rochester, which was so exciting. After I accepted I got started planning my first event as the Special Interest Group's chair. Take a look below to learn more and register for the event. The explosion of digital touchpoints (mobile, wearables, IoT) coupled with predictive analytics are enabling hyper-personalized digital experiences like never before. A recent study conducted by the Wireless Innovation Council identified over 30 dimensions of context beyond simply location and time. Understanding the user’s context and short and long term behaviors, we can trigger the appropriate interaction that provides the highest likelihood of improving user behavior and helping achieve better outcomes. 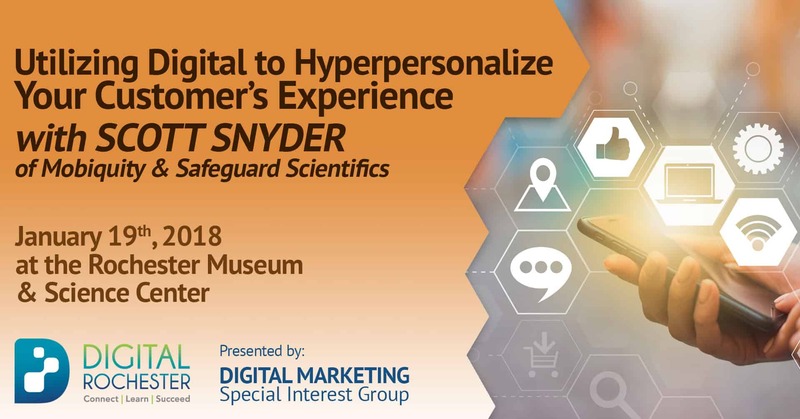 This talk will address the shift towards hyper­personalized user experiences driven by data versus just designing for traditional user segments. Historical information includes any data collected about the user’s experiences, activities, app usage behaviors, products viewed and purchases, including loyalty data. Social context includes any connection with another person that has been provided by the user, and can be determined from historical data or “heard” by the microphone, etc. Understanding the context of the user along with the short and long­ term behavioral patterns enables intelligent interactions that have the highest likelihood of resulting in the desired behavior or outcome. Scott will explore examples for healthcare and retail to illustrate how intelligent interactions work for different types of users and to rethink our approachs to UX design and also the key benefits for enterprises deciding to adopt this approach. Dr. Snyder is a recognized thought leader in technology and innovation and has more than 25 years of experience in business leadership, strategic planning and technology management for Fortune 500 companies and startup ventures. He recently joined Safeguard as the Chief Technology and Innovation Officer where he is focused on shaping the company’s future technology vision, expanding it’s innovation ecosystem, and helping Safeguard’s partner companies fully leverage the new wave of emerging technologies. Dr. Snyder was formerly at Mobiquity, a leader in delivering innovative mobile and digital solutions for enterprises, where he was President and Chief Strategy Officer, and continues to be Chairman of Mobiquity’s Advisory Board. Dr. Snyder has held executive positions with several Fortune 500 companies including GE, Martin Marietta, and Lockheed Martin, has been the CEO of a leading strategic planning firm, Decision Strategies International, and has also started business ventures in software including OmniChoice, a CRM/Analytics applications provider. He also serves on the Board of Directors for Fulton Financial Corporation (FFC). Dr. Snyder has authored a book entitled, “The New World of Wireless: How to Compete in the 4G Revolution”, and has been quoted as a thought leader in numerous publications including CIO Magazine, WIRED, Forbes, Knowledge@Wharton, Los Angeles Times, and the Wall Street Journal. Dr. Snyder is a Senior Fellow in the Management Department at the Wharton School, an Adjunct Faculty Member at Penn Engineering, and has lectured at MIT, Babson, Duke, Georgia Tech and INSEAD on Digital Innovation, Business and IT Strategy, Next Gen Wireless, Product Development, and Analytics. Dr. Snyder founded and directs the Wireless Innovation Council, which is made up of leading companies focused on cross-sector mobile innovation opportunities. Dr. Snyder earned his B.S., M.S., and Ph.D. in Systems Engineering from University of Pennsylvania. Thank you to DR's Digital Marketing SIG Sponsor VIANT! Reagan is the Owner & Creative Director of Lime Creative. 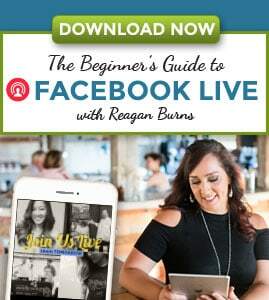 She is a Brand & Marketing Coach for small businesses.